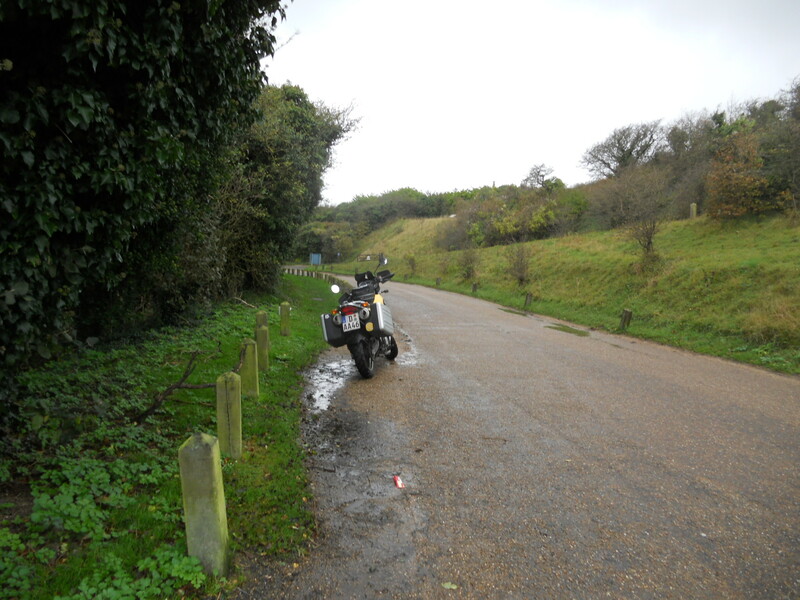 My uneventful visit to Kent was doomed by a UK holiday weekend and some incredibly crappy weather. 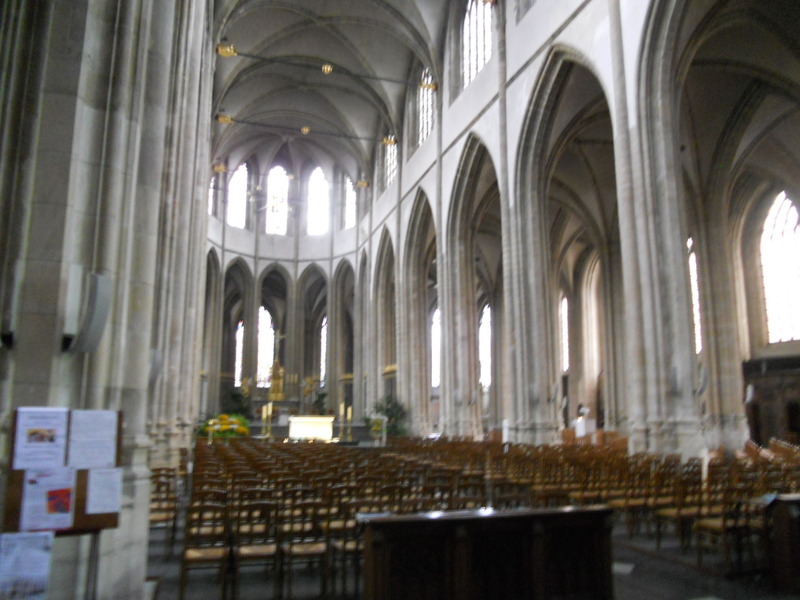 So, as I found myself awake at my normal time (that being 0500 in England), I decided to hop the ferry and spend the rest of the day poking around France, Belgium, and then getting home before dark. I hit the internet to book a P&O ticket. 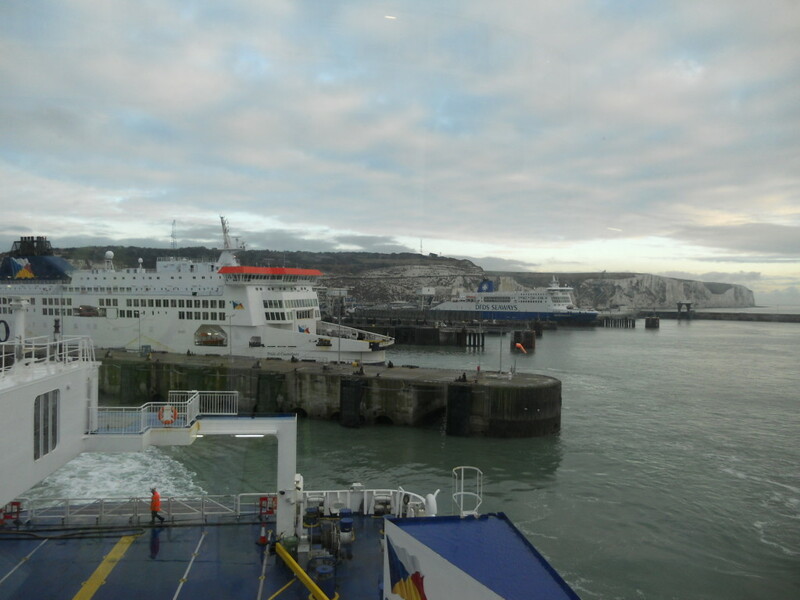 The Peninsular and Oriental Line is the largest ferry operator in the world, and runs ferries between Dover and Calais and Dover and Dunkirk. The Calais route was a bit cheaper and 30 minutes shorter, so I selected that one. I chose an 8.25 departure – I’d surely make that, and perhaps they have the same deal as le Shuttle – arrive early and leave early when possible. The Port of Dover is nothing to mess with. It’s huge, with four ferry operators moving mostly freight across the English Channel at all hours of the day and night. P&Ois the largest with the most ships and two berths. The arrival process is virtually identical to that of the train – first clear your ticket/reservation, then immigration and customs. I was not checked out of England, only checked in to France, and customs was again a wa(i)ve through. After finding the right lane – as you leave customs, you must find the lane for the ferry you have chosen and the type of vehicle you are driving – you receive a hangtag with a time on it, and a slip with a lane number. You then are signed through the port along a snakey route to your departure lane. From the departure lane, you enter the ferry. 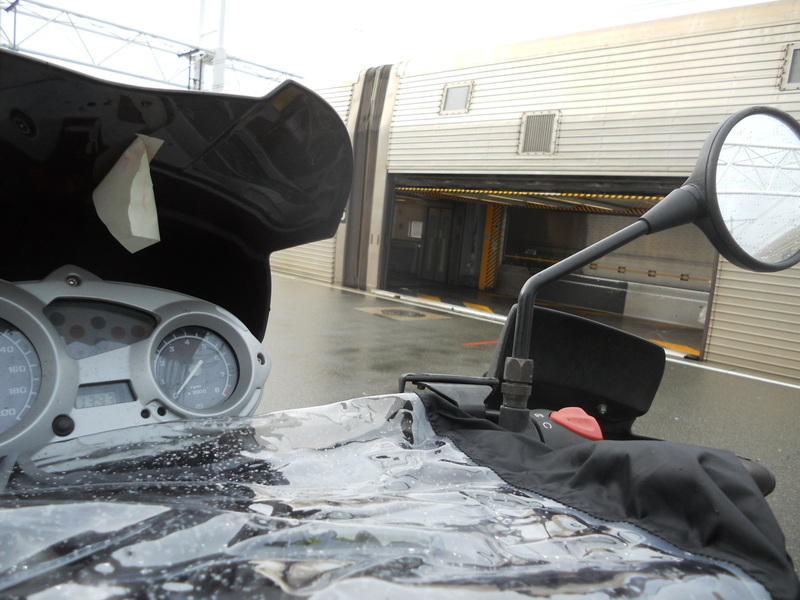 Freight boards on the lower deck, cars, caravans, and bikes on the upper deck. I was on deck seven. Riding up the ramp made me quite happy to have my little billy goat of a bike – it’s a bit steep and steel. 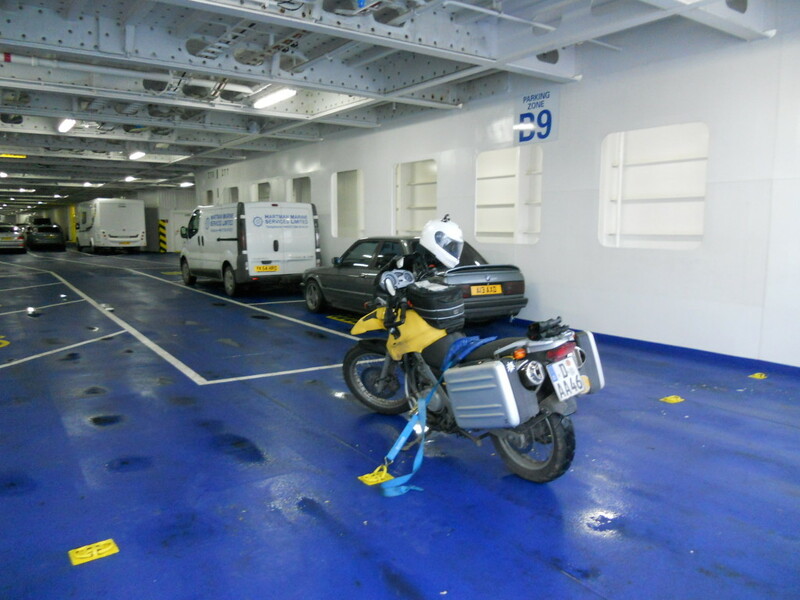 Bikes are strapped down over the seat at the rear of the ferry – there is room for up to 24 bikes on the Spirit of Britain and its sister ship, the Spirit of France. Both are among the newest and most up-to-date ships plying the Channel waterway. It is the rider’s responsibility to insure that the crew have secured the bike. 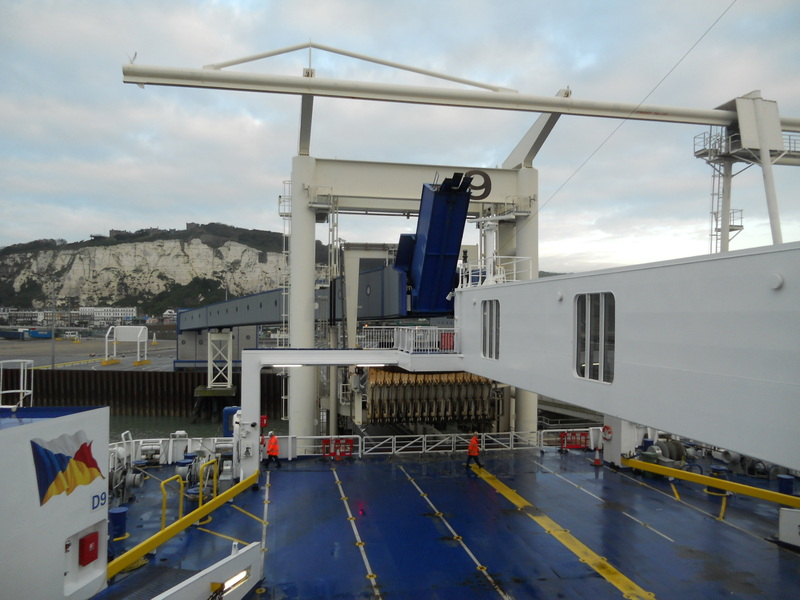 Within minutes, the crew was uncoupling the ferry from the dock and we were off, but not before the crew had shooed me upstairs – unlike le Shuttle, the rider does not remain with her vehicle. Once again, the last to load, this time by mere minutes. 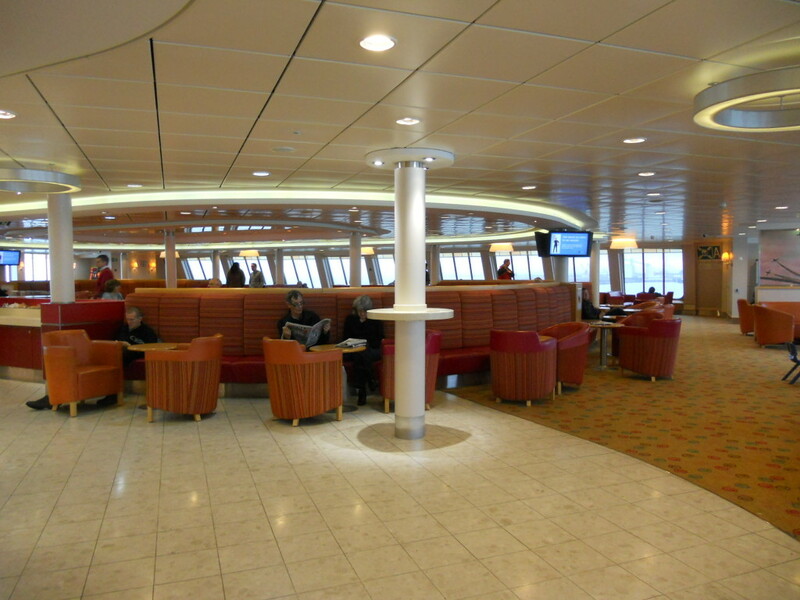 Upstairs, the boat is quite well-fitted out. Several cafes, a room full of video games, another room full of slot machines, a food court, a Club Lounge, a family area, and a reserved area for freight drivers all compete with the ubiquitous duty-free shop. I was disappointed again to find no stickers for sale. I spent most of the time out on the rear observation deck, watching the cliffs fade into the distance. The 90 minute trip is just right – time enough to explore without getting bored. The ship is well-maintained, and like all good ships, contantly being cleaned and observed by the staff. I was not prepared for the drinking Englishmen – it’s 9AM, people… even the Germans are not in the beer that early. 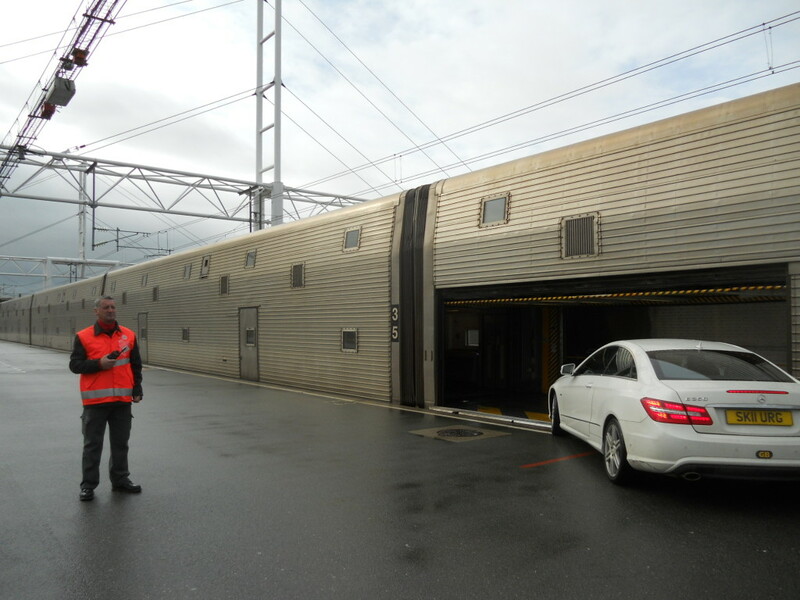 Disembarkment was the reverse of loading, with the exception that riders can scoot off behind the first lane of exiting cars. Like in Dover, the Port of Calais is simple to navigate on the exit. 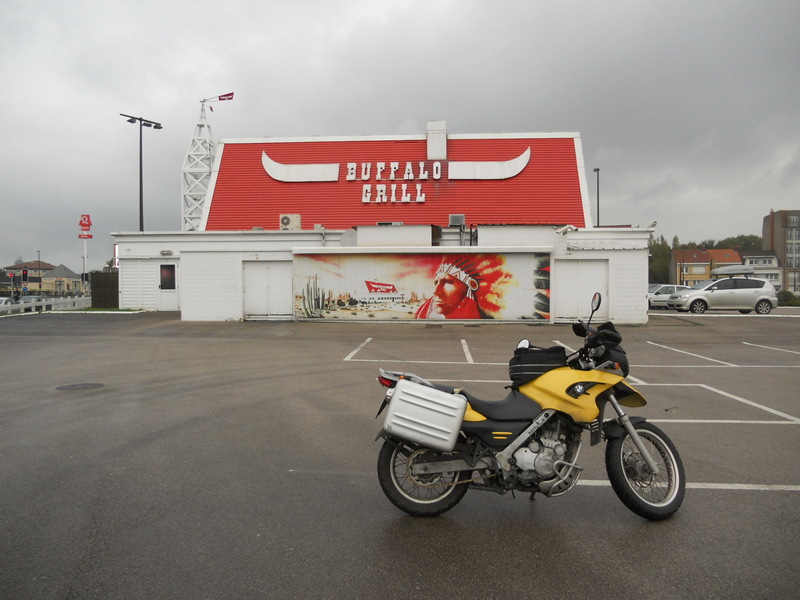 I stopped in Dunkirk to see the belfry and St Eloi church, and on the way into town could not resist snapping a pic of a very silly restaurant. 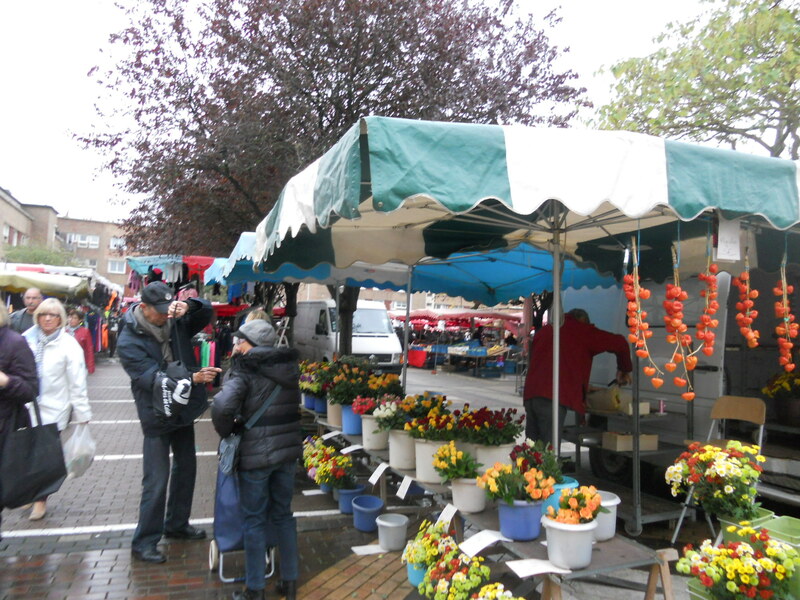 It was market day, and the entire downtown was crowded with shoppers. 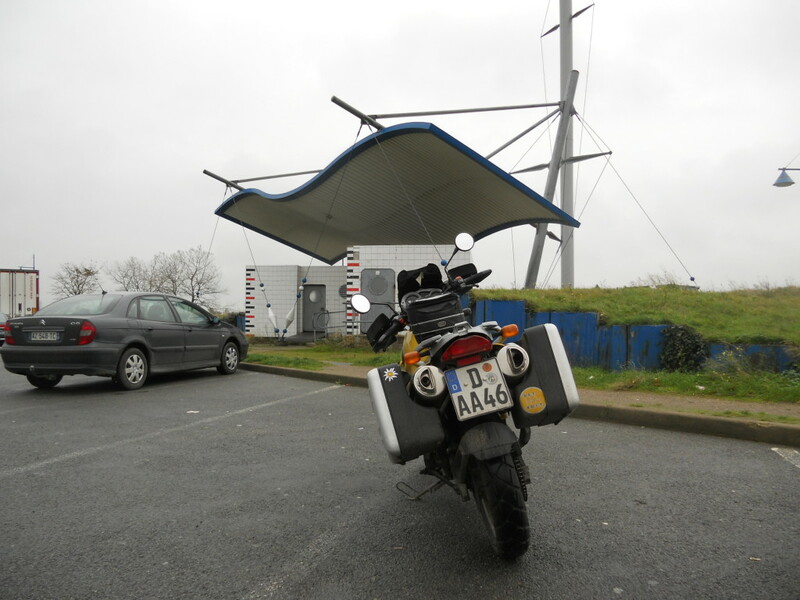 The next stop was an architecturally interesting rest stop, which like so many other things in France, was not functional. Pretty to look at in a weird 80s way. 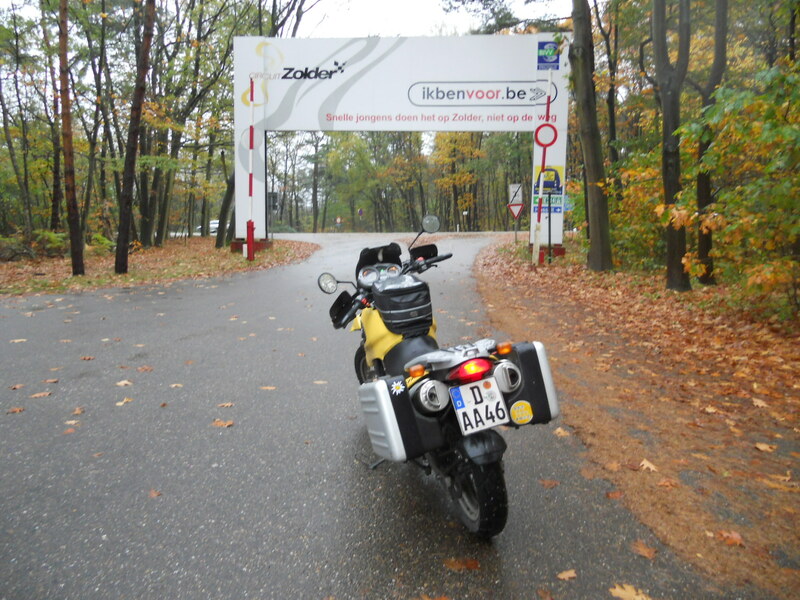 I headed over to Brugge to grab a Belgie sticker. My trusty Garmin navi then took me on a bunch of backroads, where I found that whereever Donk is, it wasn’t there. I had to ignore it for a while on the next leg, as it was trying to route me around a traffic jam. I wanted to stay on teh highway, as the lanes are wider and easier to split. The 32 minute posted delay was more like a five minute delay for me. My last stop was the Circuit Zolder in Belgium, where a testing day was taking place. Then it was into the ridiculous rain and wind and on to home, with a few more countries on the bike, and the Channel crossing complete. I decided to take a ride to Kent, UK. 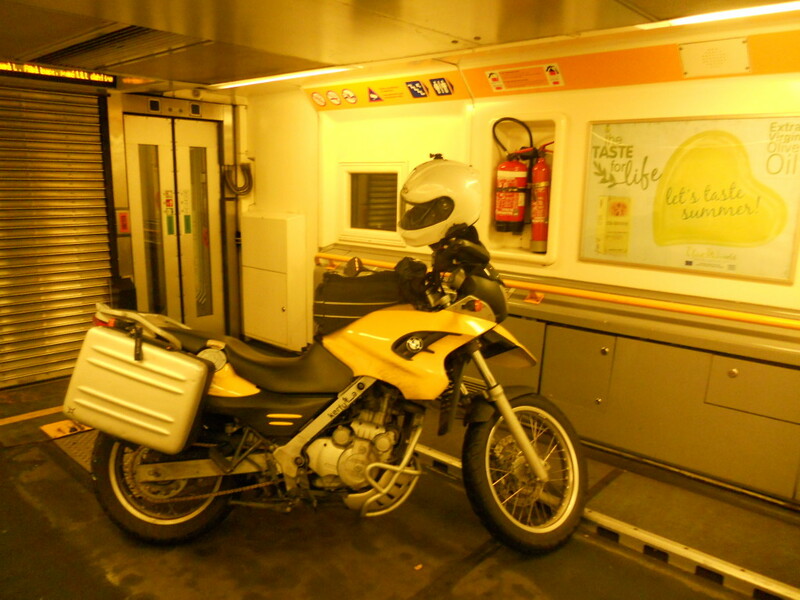 No real plans, but did want to try out the Channel Tunnel train and the ferry. 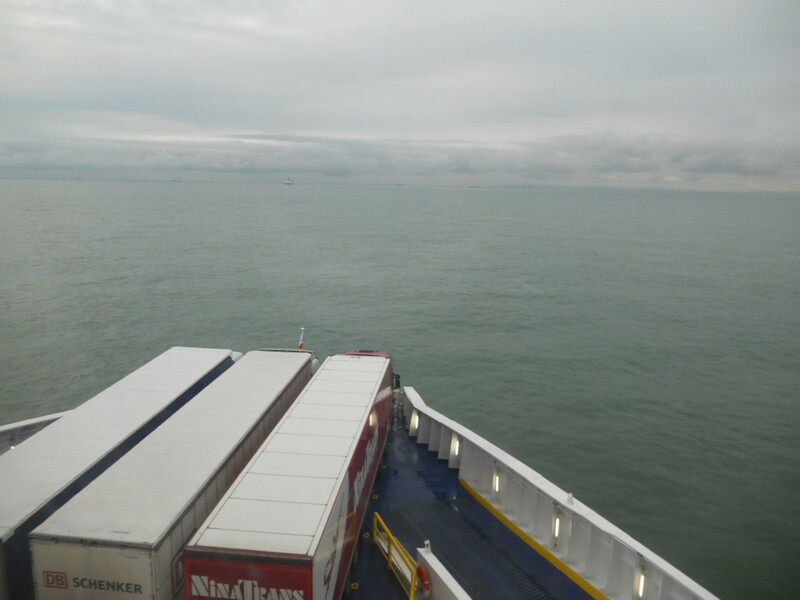 Here is a brief bit about how to cross the English Channel relatively stress-free. The first step is committing to go. All ferries and the train are cheaper if you book at least a week ahead. But even as a last minute rider, you can still take advantage of one loophole in booking – book early for the latest passage you think you’ll make, and you can take whatever is open up until then. 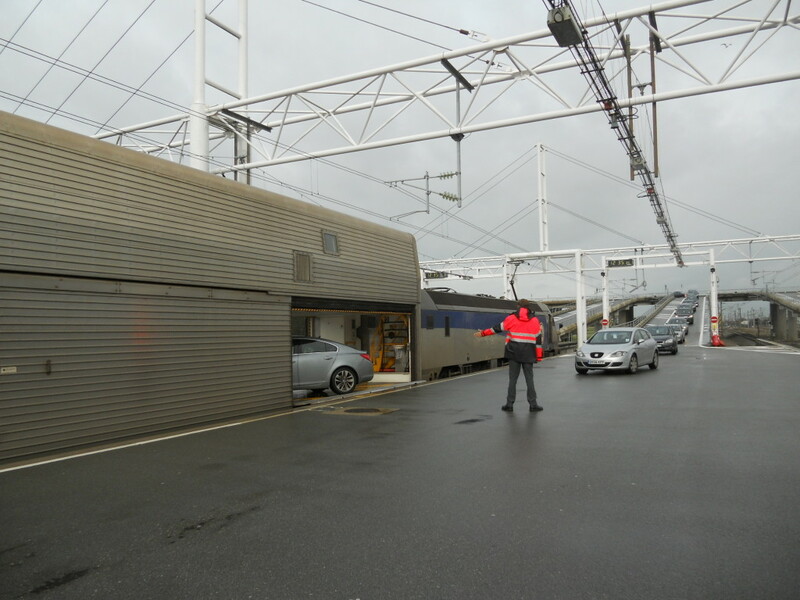 I booked le Shuttle, the French name for the train that goes under the big gash, for a 13.50 departure. The Euro Tunnel trains are priced in two-hour intervals, so I booked the latest train in the interval in which I planned to arrive. 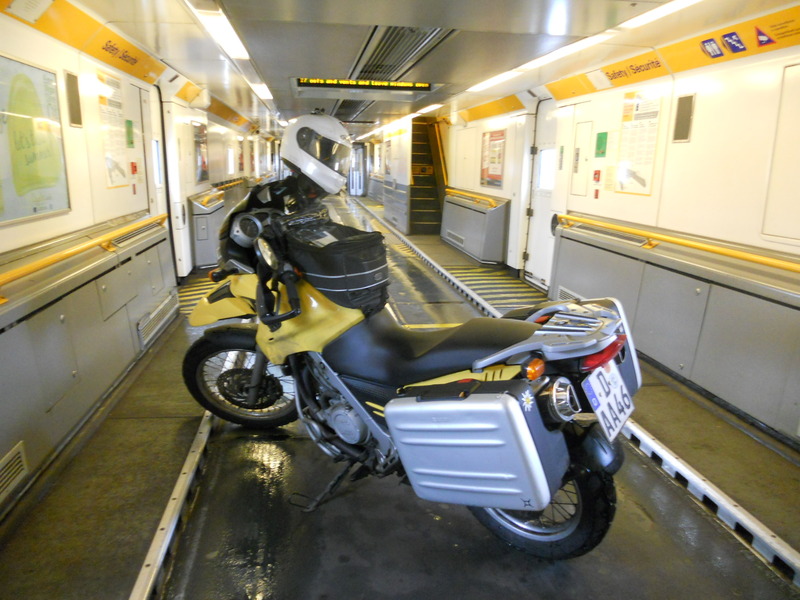 I arranged my riding to bring me to Calais a full two hours earlier to allow for some stops if I found them necessary. The Port of Calais has a rather nice shopping area, but do not count on buying postcards or stickers, there are none available. The shopping is focused on the old-school duty-free mindset of buy as much alcohol and perfume as you can. When you arrive, you come first to a booth which asks you to either buy a ticket or check-in. I punched in my reservation number and was advised that I was early and could choose any one of the three remaining shuttles in my booking window. I picked the next one and received a hangtag for my mirror printed with the shuttle code “L” and a receipt. The next step was customs and border control. The UK is not Shengen, so one must get one’s passport stamped after answering the usual questions. As an American living in Germany, I had a few more to answer, but nothing profound. 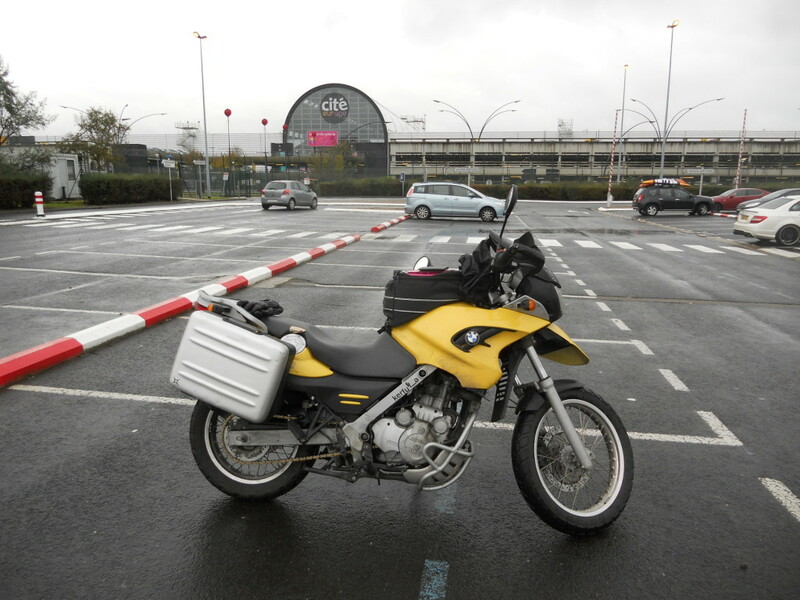 I passed first through the French border station, then through the UK station, then through Customs. Motorcycles are typically waved through Customs, how much could we be carrying anyway? Once through the paperwork (about 15-20 minutes), you are directed to a parking area near the shopping/food court. A large LED board shows the calls for trains, and you wait or shop until you are called. 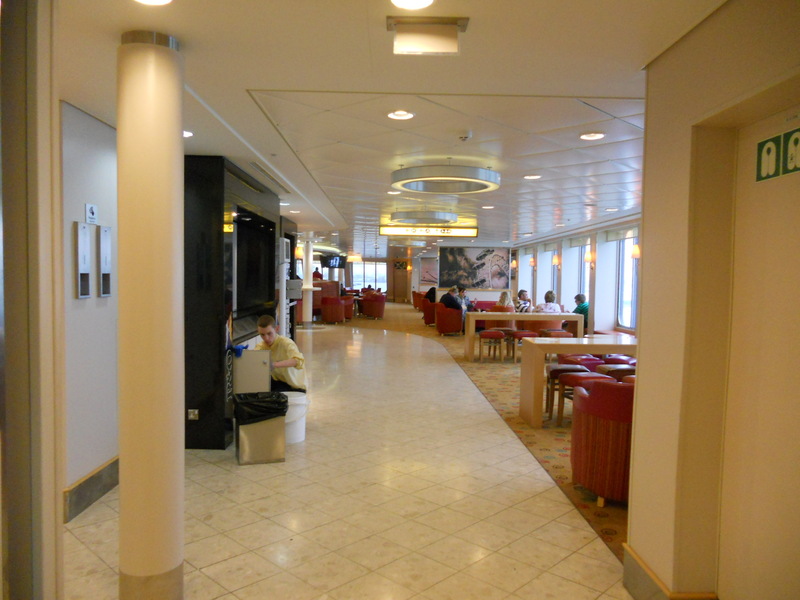 Then it is off along a winding path to the boarding area. One goes up the ramp over the train tracks, then down to board. Bikes are pooled up to board last. 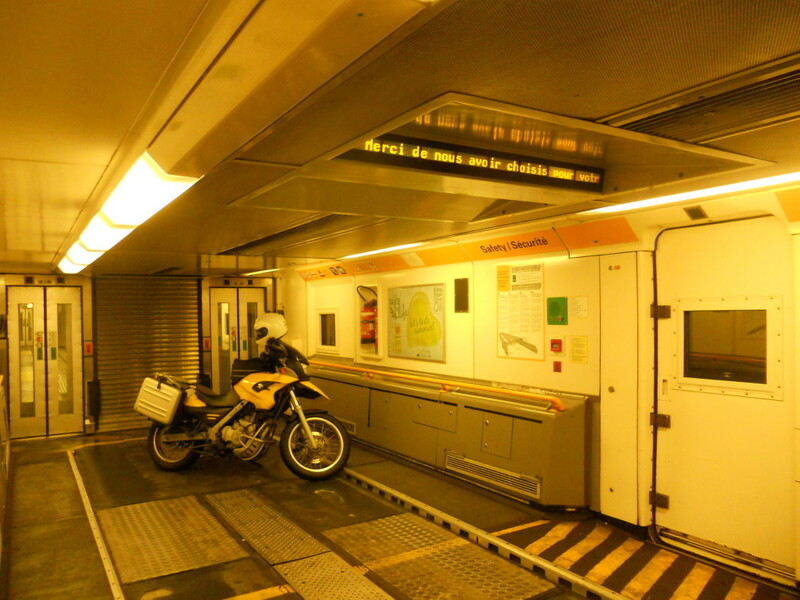 All bikes board on the lower level – the cars are sent up and down. Unlike the AutoZug, there is plenty of clearance to ride in comfortably and walk around inside of the cars. Apparently the last two cars are reserved for bikes. I was the only rider on my train, so had an entire compartment to myself. You enter the train over a steel “bridge” and then ride in. I was wisely advised to avoid the metal strip in the center – it’s not the stiffest piece of metal – and stay to one side. 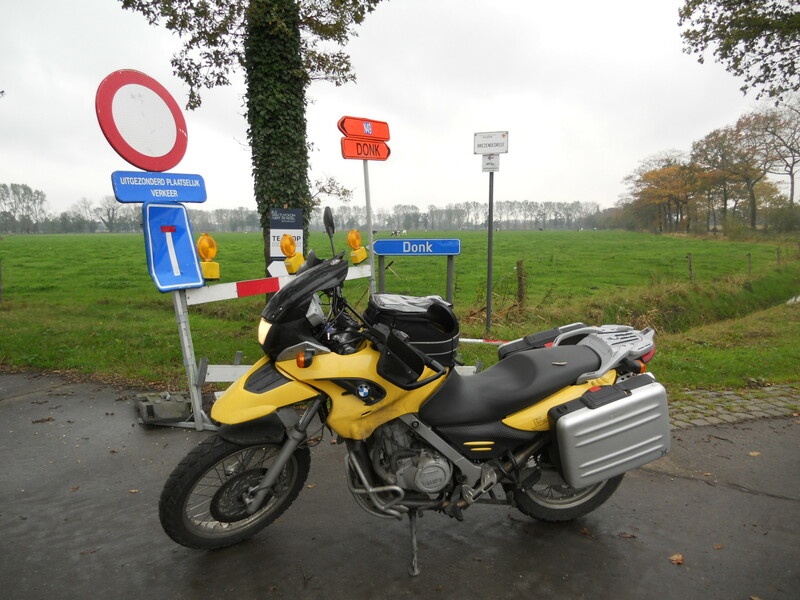 Bikes are best ridden in on the right side, then turned across the way at an angle and parked with the front tyre up against the left edge. Out comes the sidestand, and that’s it. You’re loaded on. A few safety checks, intercomparment doors are closed, and you’re off! Each car is equipped with a bathroom, but that is it. No amenities for the 35 minute trip that is 35 minutes. No longer. It’s barely enough time to snap some photos and notice that the train is moving. I was able to scarf down the sandwich I’d brought with and chat with the steward for a few moments, but it seemed like no time at all and we were back in the light. 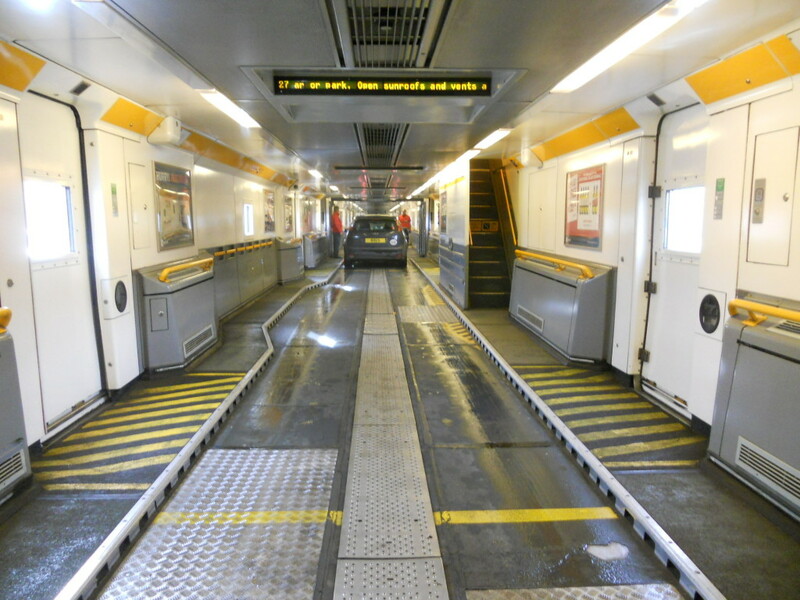 le Shuttle, as it’s called in French, is clearly designed to remain in motion. 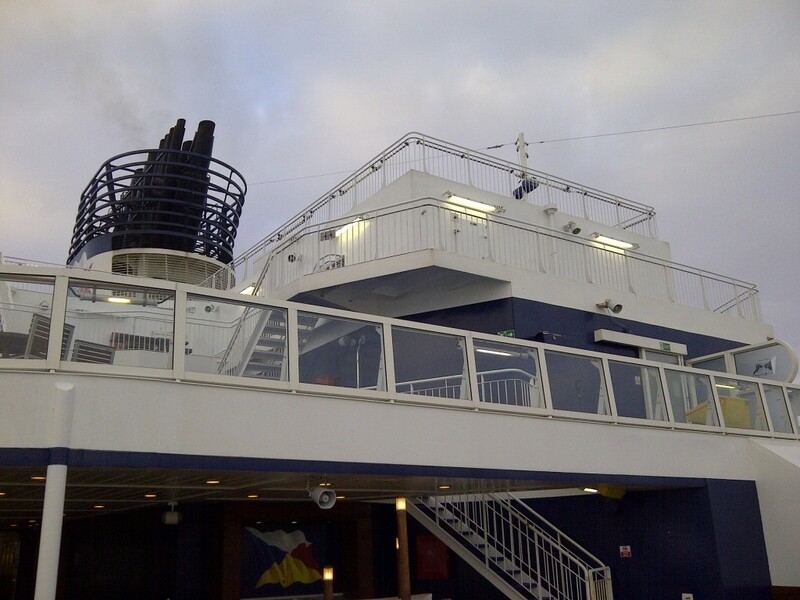 We arrived at Folkstone and began the disembarkment process. About halfway out of the train, I looked back and discovered that they were already loading the next cars. Leaving the train, one can see the forward section that is full-height and used to move freight trucks. 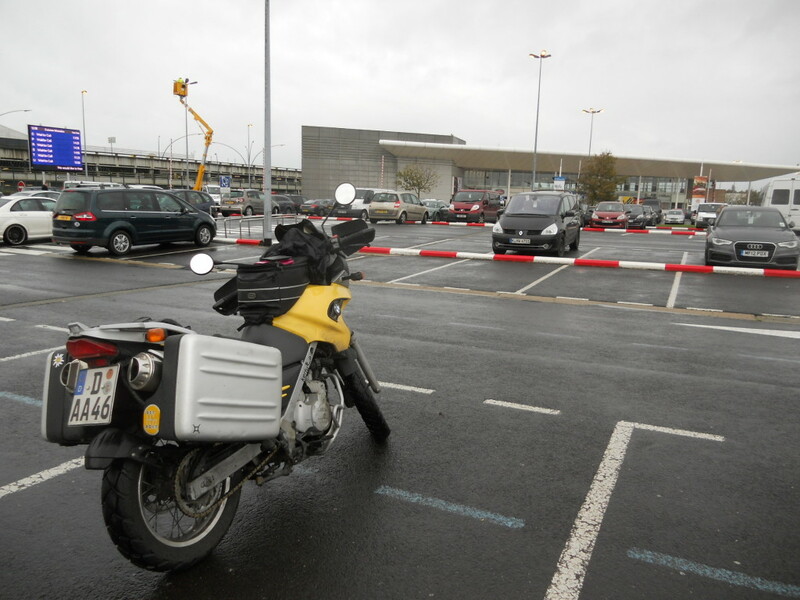 As immigration and customs were completed in Calais, one simply rides out of the terminal, up a ramp (the inductive sensor did not pick up my bike and I had to cross against the light), and into a right turn. Into the left lane. Then, a traffic circle. Ok, may as well get of that out of the way quickly. There are seemingly hundreds of signs scattered at the road side up to 50kms from Folkstone reminding people in four languages to drive on the left. 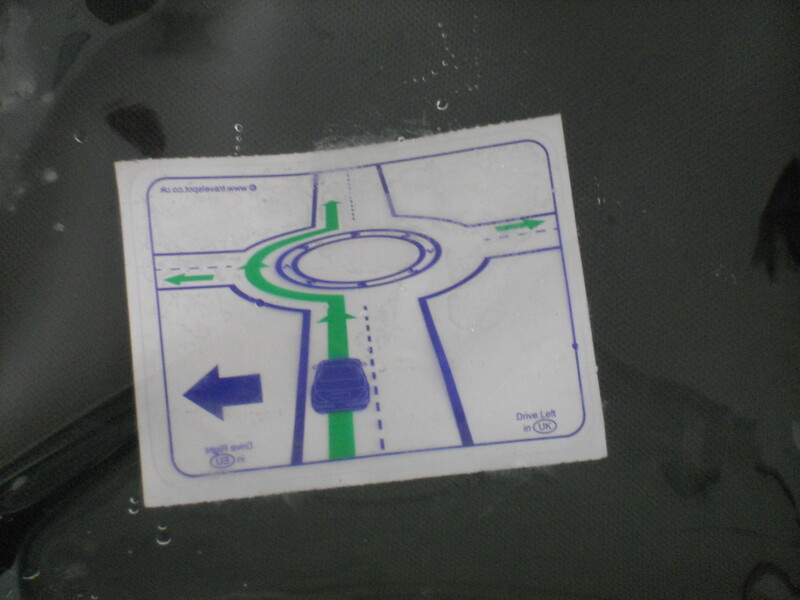 I’d purchased a smallish windscreen cling that showed the driver on the left of the road and how to navigate a traffic circle. I kept it in my map pocket stuck to its white background paper – it was a good reminder. Conveniently, it can be reversed for use on the continent. 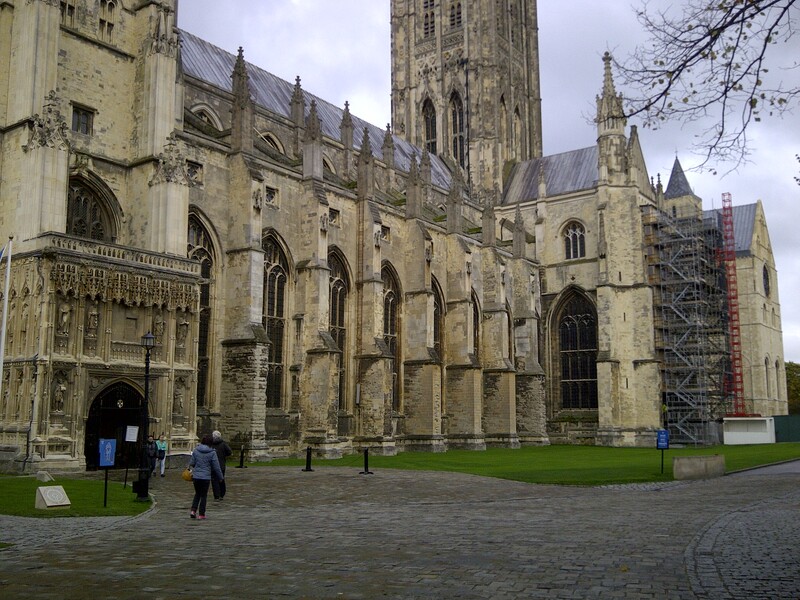 I visited the White Cliffs Nature Park and Canterbury Cathedral. Then off to Margate, which I was completely shocked by. Having spent some time at the Jersey shore, I was floored to discover that its twin exists in England. In fact, throughout my short tour of Kent, I was continually amazed to discover that there is nothing particularly special or unique about the Jersey shore, or larger parts of New Jersey and Southeastern Pennsylvania. 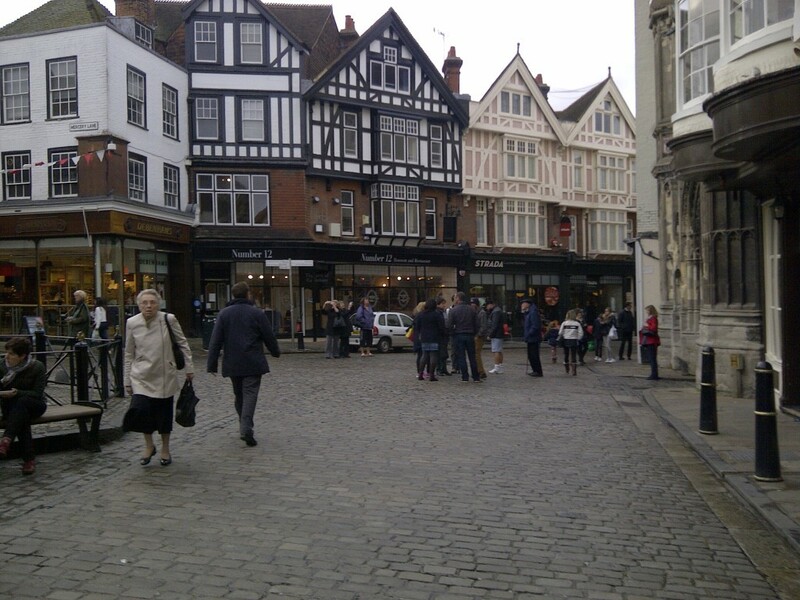 They are little carbon copies of Kent, without the cool stuff like Canterbury and Sandwich. Unfortunately, it was a holiday weekend in the UK, so I have no cool BnB story to tell – just a PremierInn that wasn’t afraid of a chick on a bike, and had a clean and comfy (if noisy due to floor squeaks) room for 65quid.